Renting your car, Please note the following about car rental. 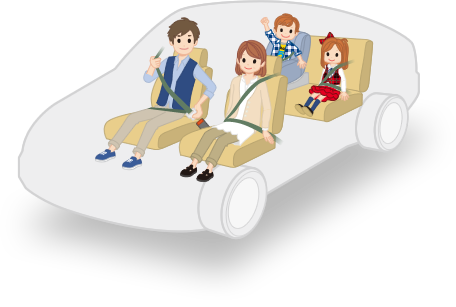 Ensure safe driving by checking that all passengers are buckled up. Never allow unregistered drivers to operate the vehicle. Unregistered drivers are not covered by insurance and can incur huge compensatory damages in case of an accident. Signs for new and senior drivers should be clearly displayed on the front and rear windows. Don't park illegally. Before drop-off, renters must attend to all parking or moving violation procedures or have proof of handling such procedures. What shall I do when car problems arise? Stop driving and contact BeBorn (translation center) for any problem. Gasoline or diesel car: You must fill the tank at the nearest gas station before drop-off. Electric car: Check location of charging facility by COCO Juden, etc., and fully charge it yourself. Contact BeBorn (translation center) asap. You'll pay penalties at drop-off, and if you're late without contacting your rental site, then additional prescribed penalties will be incurred. Changing contract time without permission or contact is a breach of rental contract, and any damage incurred shall be customer's responsibility. Contact BeBorn (translation center) after doing the following: aid the injured; report the accident to the police (110); and confirm the name and documentation of the other party in the accident. The rental car has a full tank for pick-up, so it must be the same at drop-off. If not full, the fee will be settled using our conversion table, in accordance with distance driven. Don't forget or leave anything behind in the car after drop-off. Upon arrival at your rental site, notify the staff you're dropping off your rental. Staff will check your rental car and assess charges if necessary, issue a bill for payment, and lastly, a receipt of payment. What if I leave my stuff behind? Contact your drop-off site asap about your forgotten or lost property. We do our best to search for property, but we are exempted from any loss or damage, as stated in our rental contract.Note: When handing over lost property, ID verification documents may be required.